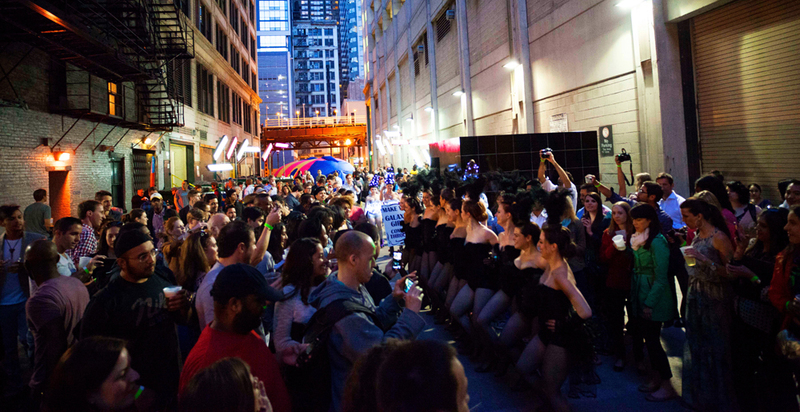 CHICAGO (April 15, 2015)—Chicago Loop Alliance (CLA), the sole service provider for Special Service Area #1, is proud to announce their popular monthly ACTIVATE series returns this summer with a new slate of alleys and artists hand-picked by local curators to transform iconic downtown alleys into urban celebrations on May 15, June 12, July 30, August 27, September 18 and October 16 from 5-10 p.m. The specific location of each ACTIVATE event will be announced the month prior at www.LoopChicago.com/ACTIVATE. Guests who RSVP in advance on the website will receive a complimentary drink ticket for beer or wine at the event, with additional beverages available for purchase on site. CLA’s first seven ACTIVATE events from September 2013 to October 2014 generated nearly $400,000 in economic impact to Loop businesses, with more than 14,000 people in attendance over the course of the series. This summer attendees will be encouraged to “Linger Longer” in the Loop by taking part in special offers from downtown businesses before and after each ACTIVATE event. ACTIVATE is part of CLA’s Loop Placemaking Initiative—an expansive series of innovative public space activations throughout the Loop that continue the organization’s commitment to create, manage and promote high-performing urban experiences in downtown Chicago. Additional placemaking programs include the reopening of The Gateway to the Loop and ongoing programming in Pritzker Park. The creative team for this year’s ACTIVATE series consists of AIGA Chicago, Chicago Design Museum, Stuart Hall, Johalla Project, Missy Perkins, Cheryl Pope and Theare Group. ACTIVATE sponsors include: Blue Moon, Columbia College Chicago, The School of the Art Institute of Chicago, Zipcar, PNC Bank, KIND, Chicago magazine, Do312 and WXRT. Chicago Loop Alliance (CLA) creates, manages and promotes high-performing urban experiences, attracting people and investment to the Loop. For more information, please visit www.LoopChicago.com.